Use seashell bathroom accessories to bring a touch of the beach into your bath and the warmth of the tropics into your home. Do you want to add a coastal or tropical touch to your bath? Sea shells are the answer! 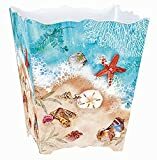 Don't worry, you don't have to live in the tropics, or even near the beach to enjoy the beauty and relaxation that seashell decor can bring to your bath. If you already have a nautical decor or coastal decor in your home, you know what I mean. Seashells fit in with a lot of different color schemes and decorating styles. And, no matter if your style is already slightly tropical or not, a few seashell accessories here and there bring the warmth and beauty of the beach to you. The bathroom is the perfect place for a little bit of coastal decor. Just look at some of the options available to you! Scallops are found in oceans all over the world, and end up in many of our favorite seafood dishes. They also end up on a lot of bathroom walls, counters, and shower curtains. 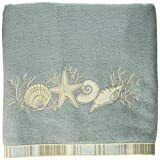 In fact, scallop shell motifs are among the most popular seashell bath accessories. But, did you know that scallops are bivalves? 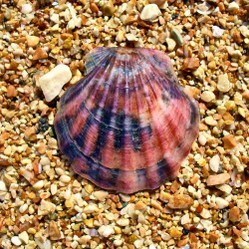 Bivalve is the common term for the class bivalvia. These mollusks, found in salt, fresh, and brackish water, are common and plentiful. Bivalves live inside a shell with two sides that are joined with a sort of a hinge so that they can open and close. So, a single scallop shell, like the one you see here, is only half of a scallop's "home." Other familiar bivalves include oysters, clams, and mussels. Learn more about bivalve shells here. The study of seashells is Conchology. Those who study shells are Conchologists. Long ago, shells were used like money. One shell was so widely used as currency that its name is the Money Cowery. Ian Fleming, who created James Bond, was an avid shell collector. Shells are the skeletons of mollusks. Our skeletons are on the inside; theirs are on the outside. Both are made up largely of calcium. A good time to find shells on the beach is at the first low tide after a really big storm. When enhancing your bathroom decor, there are other options that are often overlooked. These are more lasting in nature than a new set of towels today that may be in the hamper tomorrow. Some are easily installed and removed, while others are a bit more permanent. Switch plates, outlet plates, and cabinet knobs are lasting additions that are easily installed, and just as easily changed out when you tire of them. Wall paper borders take a little more time and effort to put in, but can still be removed (with a little effort) when you are ready to do so. Finally, consider decorative ceramic tiles when you are innovating a bath. 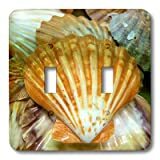 You can place 4.5" or 6" tiles with pictures of shells on them here and there among your plain wall tiles. Even if you are using larger wall tiles, someone who knows what they are doing can custom fit the smaller ones in among the main tiles in an artistic arrangement. NOTE: For more examples of sea themed cabinet hardware, see Seashell Cabinet Knobs. If you want to find your own seashells to make accessories with, a good place to find them is on Sanibel Island, Florida. More than 400 shell species can be found on Sanibel's beaches. Go there, and you're sure to find some keepers, like the people in the video that follows did. Harvesting live shellfish is not allowed. If there's animal in the shell, put it back! They are serious about protecting sea life in Lee County! o you struggle with a lack of storage in your bed and bath area? (Who doesn't?) 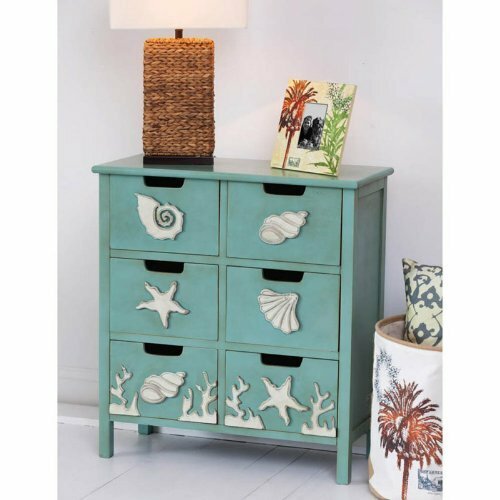 Find a solution and make a statement at the same time with this coastal themed chest. If you have a wall space just 29" or so wide, this chest will fit with an inch to spare! But, wait! This piece is so versatile, it could fit in just about any room, and compliment a nautical, coastal, tropical, or even retro decor. Against a background as blue as the sea, white seashells, starfish, and corals look clean and fresh in color, as well as by virtue of the simple artistic interpretation. All of the above things are simple enough for just about anyone to do! The finished project will add a nice personal touch to your master or guest bath. Not only that, you might find your finished handiwork will be an appreciated gift for a beach lover! For those who would love to get creative with seashells, but can't get to the beach to find them, why not get a shell mix to get you started? Oh, you had a nice mess on your hands, then! One should ALWAYS check to see that the former inhabitant has vacated their home before removing the shell from the beach. And be awarel of local laws - some prohibit the collecting of things like sand dollars, starfish, and other specific things. Fines can be really hefty. Shells are interesting and can make great decorations, as can their images. 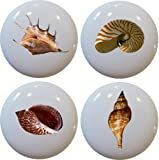 My wife bought a nice collection of shells for decorating purposes, and I used a few to photograph for Zazzle items. Just always make certain they are abandoned. One of my brothers gathered a nice collection only to find they were inhabited by hermit crabs after we got them home. There's something very special about a walk on the beach, isn't there? And if you bring home a shell or two, that's a bonus! I love walking on the beach and collecting seashells. I have them scattered eveywhere in my home. The blue cabinet is really pretty.